The McNeelys are used to having great football players in the family as the late great Joe McNeely was a legendary linebacker who was an All-American in 1973 at Louisiana Tech. Joe McNeely may be a legend and an all-time Bulldog, but his son Joey McNeely may end up being even better than his father. Joey McNeely is a senior defensive tackle at Kinder High School and is already recognized as one of the best defensive linemen in the entire state. Last season, McNeely made his own name racking up over 50 tackles, 31 assists, ten tackles for loss, three sacks, five fumble recoveries, and a blocked punt. Those numbers helped him achieve major accomplishments like his father such as 1st Team All-District, All-Southwest, and even All-State. He also played a big part in the Yellow Jackets’ 2015 run to the state championship. Entering his senior year, he has accomplished mostly everything that a high school player can dream of. 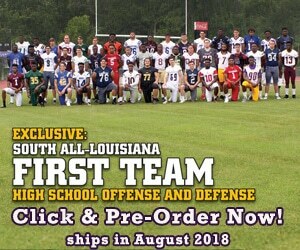 Before the season started, McNeely was recognized even more being the number three player in KPLC’s top seven high school football prospects right above teammate Jordan Cordova. 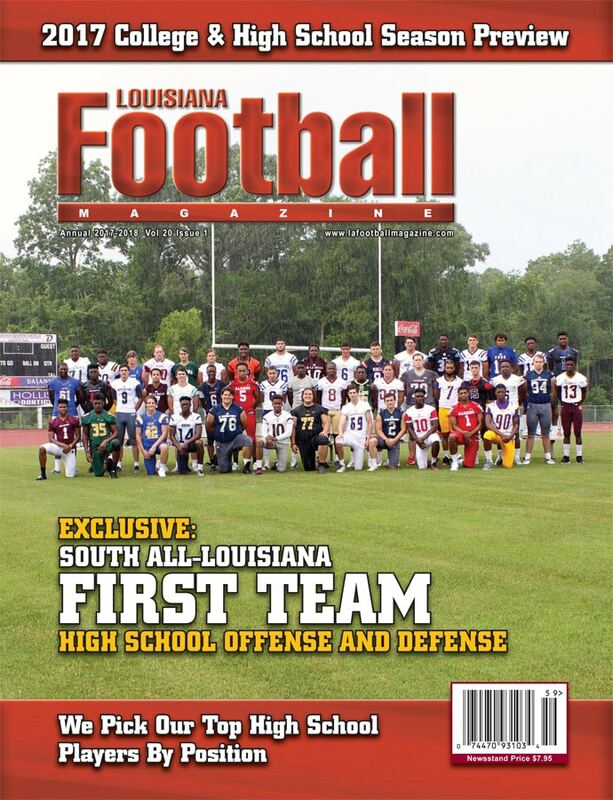 He also was recognized by our very own recruiting expert Lee Brecheen who put McNeely on the front cover of our South Louisiana magazine as well as being named to our All-South Louisiana team. Even though Brecheen sees McNeely on the offensive line, McNeely is doing his damage on the defensive line and is still being offered by teams such as Army, Navy, McNeese State, Northwestern State, and others. What Joey McNeely has accomplished in just a couple of years has been nothing short of incredible and there is no doubt about it that his father would be proud. In today’s recruit spotlight, we caught up with the Kinder senior All-State defensive tackle as he talked about his great high school career, his father, his relationship with star safety Jordan Cordova, his top schools, and so much more! LAFM: You have received a few offers so far. What are some of those schools that have offered you and what are your top schools? I have received offers from Army, Navy, ULM, McNeese St., Northwestern St., Arkansans Monticello, and Arkansas Pine Bluff. Every one of them, I consider to be a top school. 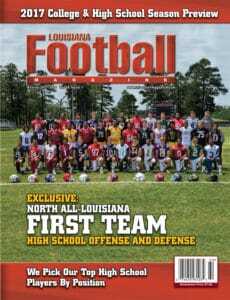 LAFM: You are on the cover of our South Louisiana edition of the magazine and you made our All-South Louisiana team as an offensive guard. What does it mean for you to be recognized as one of the best players in the state heading into your senior season? 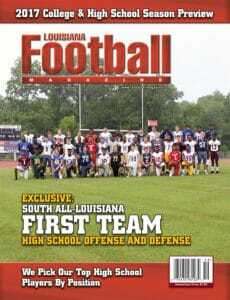 It is truly a blessing from God to be recognized as one of the best players in the state. The biggest strengths to my game is that I’m quick off the ball, hard to move on a double team, and I hustle on every play. I need to improve my game on getting faster, stronger, and more explosive out of my stance on a pass rush. LAFM: You mostly play on the defensive line but our recruiting expert Lee Brecheen thinks that you can play offensive guard in college. What position do you prefer playing at the next level? I prefer playing defensive line in college because I feel like I’m better on that side of the ball and I can dominate. Last year getting 1st team All district, all-Southwest, and getting coaches’ 1st team All-State was very big for me as well as winning state my sophomore year. LAFM: What are the biggest things that you look at when finding a school? The biggest things I look at when finding a school is the playing time I’m going to receive and the way I get recruited. I want to be a person they want not a number. I also look at the way they treat my family. LAFM: Let’s talk about the season so far. The team is 5-4, which is a little bit of an up and down year but is there anything about the team that you feel most excited about heading into the final week of the regular season and into the playoffs? I feel as when we play how we play, we are the best 2A team in the state and I feel confident going into this week because it’s gonna be a big challenge and if we can win that, it will be a huge boost for us going into the playoffs. LAFM: You and Jordan Cordova are a great one two punch on defense as it seems that you control the line of scrimmage while he gets things done in the back half of the defense. What is the relationship like between you and Jordan on the field as well as off the field? Jordan and I really just have like a brother to brother relationship. On the field, we try to let our play do the talking. Off the field, we hang out a lot of the time and if we aren’t hanging out, we’re always joking around on some type of social media. My best game happened in my sophomore year against Welsh in the district championship because I was going against an offensive lineman who had signed to play football for McNeese St. and I felt like I had a pretty good game. When football is over, I usually like to play basketball, hang out with friends, and workout. LAFM: What were some of your goals that you set for yourself at the beginning of the season after having a great season last year? My goal was to leave Kinder with a district and state championship at the beginning of the year and be the best leader I can be. LAFM: What is your message to the Kinder team for the rest of the season? My message to my team would be to not look at our record and get upset because there is still a lot of football left to be played for this team. I want to thank my whole family from my mom, grandma, sister, my first cousin, aunt, uncle, and my brother, who always tries to show me the right ways. I also want to thank my coaches, my trainer Justin Smith, Mr. Robert, and my uncle, who got me with him. 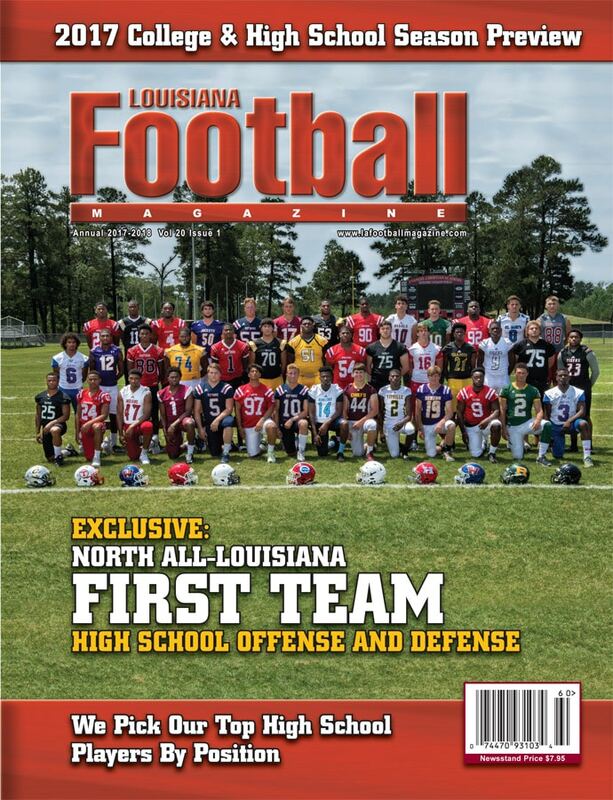 LAFM: Your dad was a great football player at Louisiana Tech. Did you ever get the chance to watch some of his old highlights? If so, do you see any similarities between you and when your dad played? I always researched his highlights, but I’ve never gotten to watch him, but from what I hear is that he was the meanest and hardest hitting player anyone has ever watched. LAFM: You are a pretty nice guy when I talk to you off the field, but when you are on the field, you are one of the meanest players I have seen. Where do you get that anger when you are on the field? I feel like I get that anger just from being competitive because when I’m on the field, if you’re not on my team, you’re trying to hold us back and I’m not going to let that happen. My friend Josh Harmon used to always tell me “that guy lined up across from you is trying to hold you back from living your dreams of playing college football and your dream of taking care of your family”.